These London blue topaz and half-moon facet diamond earrings in 14K white gold from Apples of Gold Jewelry are a colorful and beautiful way to wear your favorite gemstone. 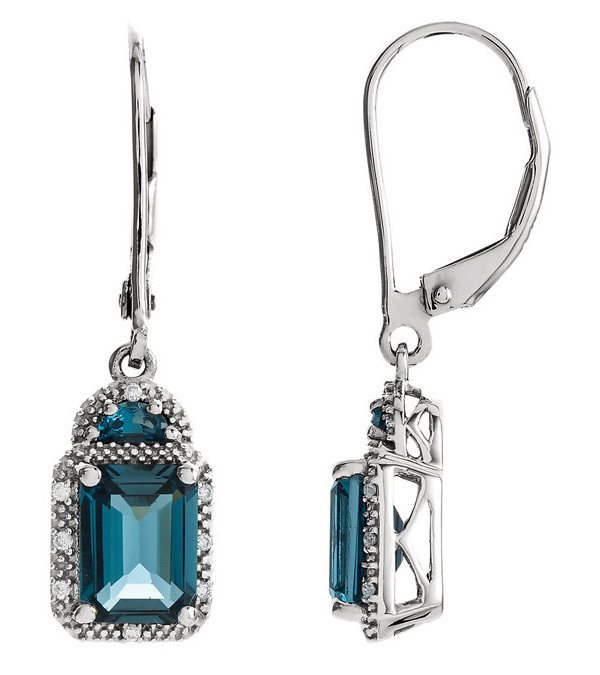 These earrings measure just under 1 1/4" tall x 5/16" wide, and feature an 8mm by 6mm emerald cut London blue topaz gemstone in each, weighing 1.80 carats each. Above that emerald cut London blue topaz stone sits a half-moon facet London blue topaz that measures 4mm by 2mm each, with each having a carat weight of 0.11. The half-moon gemstones are a very unique and beautiful cut, and might remind you of the moon over the ocean, with a deep blue color. The earrings also include 0.06 carats of diamonds total for the pair, with each earring having 8 diamonds for a total of 16. The diamonds are rated H-I for color andI1 for clarity. The earrings have lever-back closures, and for those who really love the look of the gemstones and the diamonds in these earrings, they are also available with a matching pendant. We guarantee our London Blue Topaz and Half-Moon Facet Diamond Earrings, 14K White Gold to be high quality, authentic jewelry, as described above.